On our latest podcast we discussed Liverpool’s 1-1 draw with Southampton – their third draw in a row under the new German manager. 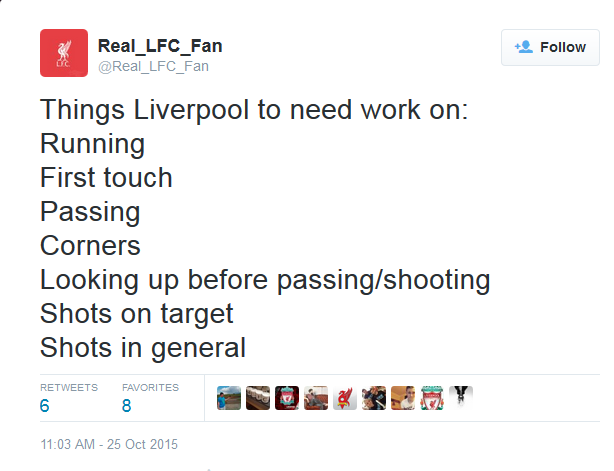 Here, @Real_LFC_Fan gives us a Liverpool fan’s perspective on Klopp’s first few weeks in charge at Anfield. It has finally happened. The football Gods have answered our prayers. We have landed the manager of our dreams. Liverpool fans everywhere have gone crazy with the appointment of Jürgen Klopp and it seems like everyone has a case of Kloppomania. But, of course, there are still doubters…and we know Jürgen wants to “change the doubters to believers”. Commentators and analysts (if that is what you want to call them) have already jumped on and off the Klopp bandwagon several times. Three days into the job, Klopp managed to draw against (my personal rivals) Spurs. Many were quickly impressed with the huge difference in the team. The pressing was obvious, the players seemed revived and the defence…well…that’s a whole other story. The new manager has managed three consecutive draws and a win with his newly acquired, weakened team. The likes of Gomez and Ings have joined Sturridge’s injury club. Coutinho’s form seems to keep dropping with every passing week, with every pass and shot. Milner seems to be (literally) running midfield (does it even exist anymore?) with Lucas still strongly holding in front of the back four. Meanwhile, Moreno has had a second coming and has been running the show on his own on the left wing. Most people who have been following Liverpool lately can agree that there has been positive change with the new managerial staff. We are however; still ‘blessed’ with the long list of players that Brendan Rodgers has left behind. Fatigue has been a massive factor in the past few weeks, with back to back games from the Premier League to Europa League to the League Cup. At times, there seems to be a lack of organization and it’s almost like players are running around aimlessly just to chase the idea of the gegenpressing. However, based on the reaction among fans on Twitter, it is quite humorous to find people judging Klopp of his first few weeks, when in reality it has been the players’ performance and individual errors that have lead to the frustration with losing leads, missing crucial goal-scoring opportunities and defensive errors. Time and patience can only lead to good things. The Reds face the defending Champions this weekend. With Jose Mourinho’s side slowly going down the gutter, this is the perfect time for Klopp to get his first win. We go again!